Thank you for your interest in traditional arts at the Sawmill Center! Our classes have adjourned for the 2018 season. Please check back in the spring of 2019 for our latest offerings. Sawmill Center for the Arts offers a variety of classes in traditional art forms. From painting to wood carving, quilting to jewelry making, we offer something for everyone. 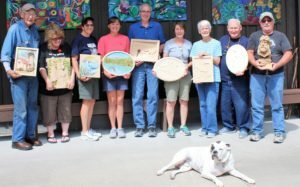 Whether you are looking to start a new hobby or you are honing a skill you’ve had for decades, the Sawmill Center is committed to helping you express your creativity. Pre-registration is required for all our classes, and a 50% deposit will hold your seat. Register by calling our office at (814) 927-6655. The remaining 50% and any materials fees will be collected the first day of the class. Payments may be made by check or credit card. We have a no refund policy, meaning your deposit will not be returned if you are unable to attend. If the Sawmill Center cancels a class, a full refund will be issued. Please bring a snack, drink or lunch with you. There are local restaurants we can order from as well. We have coffee and tea available .